On its journey to the Pacific Ocean the Lewis and Clark Expedition camped near here on September 2, 1804. At this camp the explorers' imagination and knowledge of military fortifications misled them into concluding that sand ridges and mounds left by Missouri River floods were an ancient fortification. Captain Clark made a detailed survey of these natural features. Clark recorded his concern for Private George Shannon who, at 19, was the youngest member of the Corps of Discovery. He had been missing for five days after going in search of stray horses. He was not found until September 11. Clark explained, "He had been 12 days without any thing to eate but Grapes & one Rabit, which he Killed by shooting a piece of hard Stick in place of a ball. This man Supposeing the boat to be a head pushed on as long as he Could, when he became weak and fiable deturmined to lay by and waite for a tradeing boat." 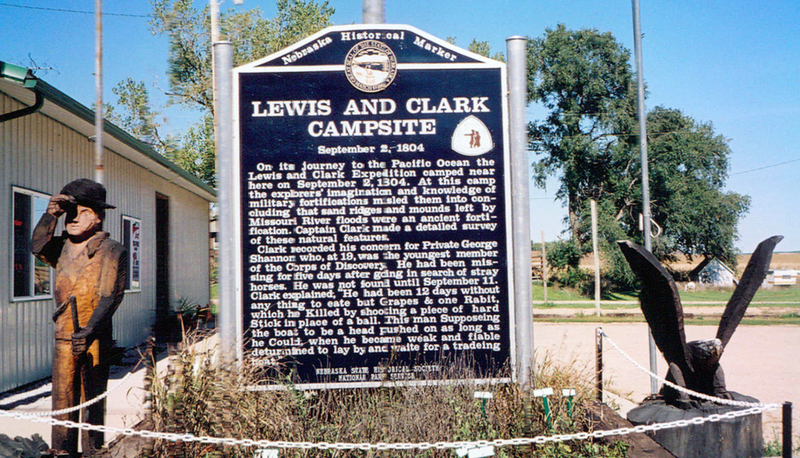 “Lewis and Clark Camp Site: Sept 2, 1804,” Explore Nebraska History, accessed April 19, 2019, https://mynehistory.com/items/show/314.